Hua Guo and David H. Laidlaw. Topic-based Exploration and Embedded Visualizations for Research Idea Generation. IEEE Transactions on Visualization and Computer Graphics, 2018. (pdf) (bibtex: Guo-2018-TEE). Prithima Reddy Mosaly, Lukasz M Mazur, Fei Yu, Hua Guo, Derek Merck, David H. Laidlaw, Carlton Moore, Lawrence B Marks, and Javed Mostafa. Relating task demand, mental effort and task difficulty with physicians performance during interactions With Electronic Health Records (EHRs). International Journal of Human--Computer Interaction, pages 1--9, 2018. (pdf) (bibtex: Mosaly-2018-RTD). Ryan Cabeen, Mark E Bastin, and David H. Laidlaw. 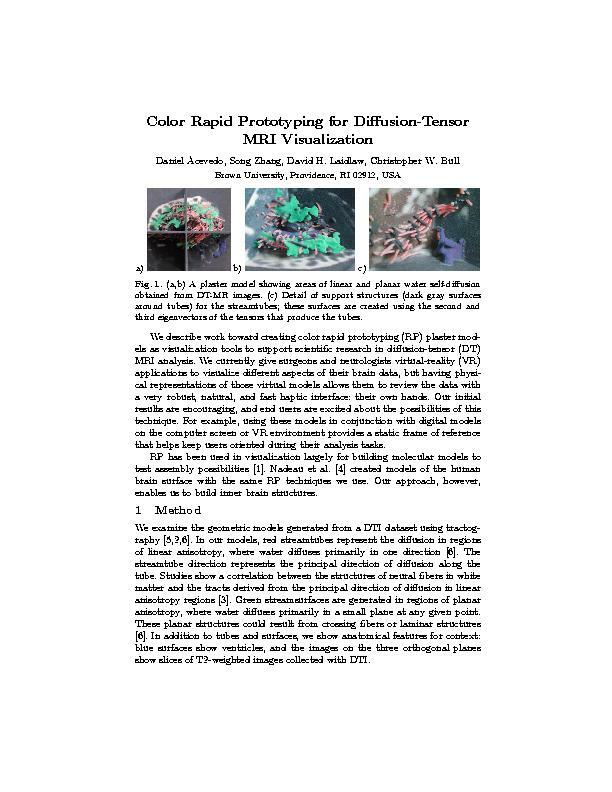 A Comparative Evaluation of Voxel-based Spatial Mapping in Diffusion Tensor Imaging. 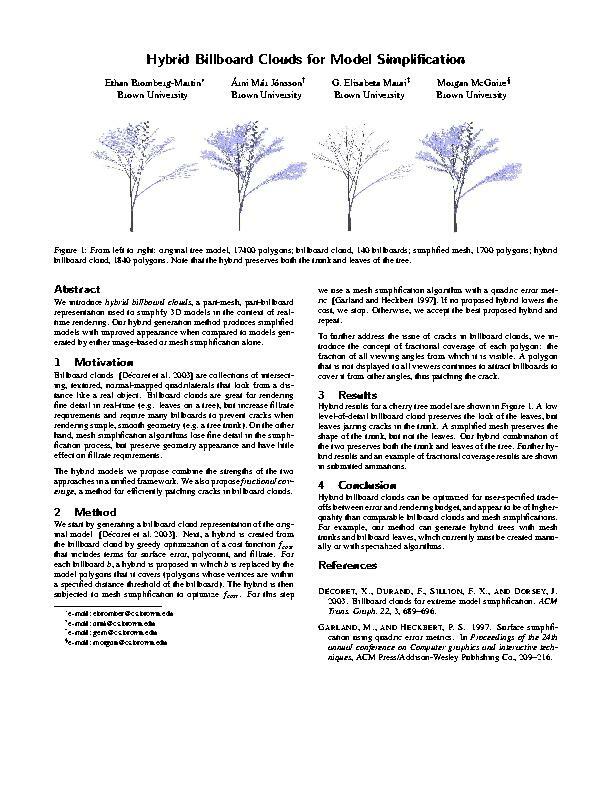 NeuroImage, 2016. published (pdf) (bibtex: Cabeen-2016-CEV). Ryan Cabeen. Developing and Evaluating Computational Tools for the Modeling, Visualization, and Analysis of Brain White Matter with Diffusion MRI. PhD thesis, Brown University, 2016. (pdf) (bibtex: Cabeen-2016-DEC). Steven R. Gomez, Radu Jianu, Ryan Cabeen, Hua Guo, and David H. Laidlaw. Fauxvea: Crowdsourcing Gaze Estimates for Visualization Analysis Tasks. IEEE Transactions on Visualization and Computer Graphics, February 2016. (pdf) (bibtex: Gomez-2016-FCG). Connor Gramazio, David H. Laidlaw, and Karen B. Schloss. Colorgorical: Creating discriminable and preferable color palettes for information visualization. IEEE Transactions on Visualization and Computer Graphics, 2016. (pdf) (bibtex: Gramazio-2016-CCD). Wallace S Lages, Gustavo A Arango, David H. Laidlaw, John J Socha, and Doug A Bowman. Designing capsule, an input device to support the manipulation of biological datasets. 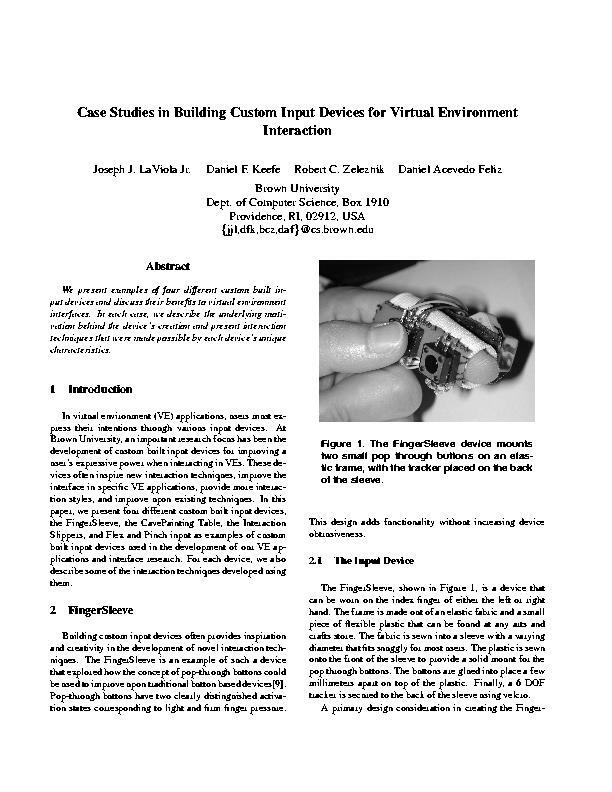 In IEEE Symposium on 3D User Interfaces (3DUI), pages 255--256. IEEE, 2016. (pdf) (bibtex: Lages-2016-DCI). Hua Guo, Steven R. Gomez, Caroline Ziemkiewicz, and David H. Laidlaw. A Case Study Using Visualization Interaction Logs and Insight Metrics to Understand How Analysts Arrive at Insights. In Proceedings of IEEE VAST, 2015. (pdf) (bibtex: Guo-2015-CSU). Hua Guo, Jeff Huang, and David H. Laidlaw. Representing Uncertainty in Graph Edges: An Evaluation of Paired Visual Variables. IEEE Transactions on Visualization and Computer Graphics, 2015. (pdf) (bibtex: Guo-2015-RUG). Scott Houde, Sheila Bonde, and David H. Laidlaw. An Evaluation of Three Methods for Visualizing Uncertainty in Architecture and Archaeology. In Proceedings of IEEE VAST (Posters), 2015. (pdf) (bibtex: Houde-2015-ETM). Mark D.M. Leiserson, Connor Gramazio, Jason Hu, Hsin-Ta Wu, David H. Laidlaw, and Benjamin J. Raphael. MAGI: visualization and collaborative annotation of genomic aberrations. Nature Methods, 12(6):483--484, 2015. (pdf) (bibtex: Leiserson-2015-MVC). Steven R. Gomez, Hua Guo, Caroline Ziemkiewicz, and David H. Laidlaw. An Insight- and Task-based Methodology for Evaluating Spatiotemporal Visual Analytics. In Proceedings of IEEE VAST, 2014. (pdf) (bibtex: Gomez-2014-ITM). Connor Gramazio, Karen B. Schloss, and David H. Laidlaw. The relation between visualization size, grouping, and user performance. In IEEE Transactions on Visualization and Computer Graphics, volume 20, pages 1953--1962, 2014. (pdf) (bibtex: Gramazio-2014-RVS). Anne Kenyon, John van Rosendale, Samuel Fulcomer, and David H. Laidlaw. The Design of a Retinal Resolution Fully Immersive VR Display. In Proceedings of IEEE Virtual Reality, 2014. (pdf) (bibtex: Kenyon-2014-DRR). Daniel Keefe and David H. Laidlaw. 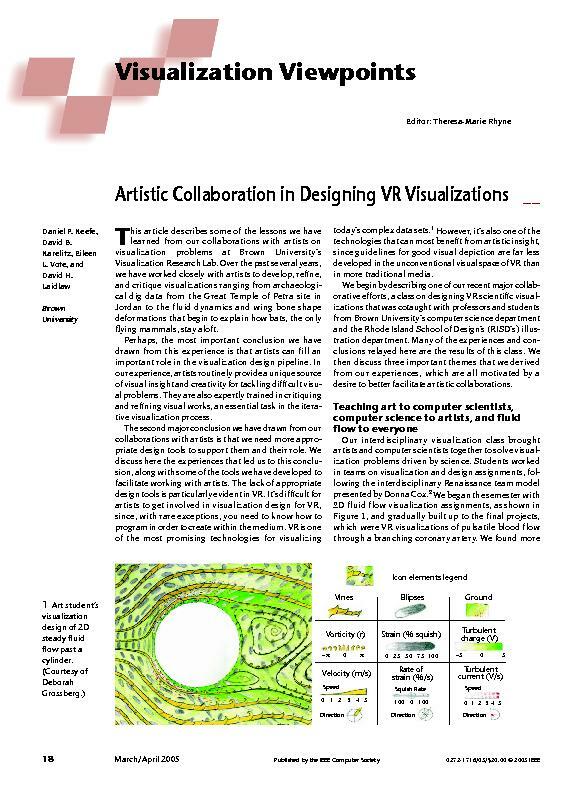 Virtual Reality Data Visualization for Team-Based STEAM Education: Tools, Methods, and Lessons Learned. In Virtual, Augmented and Mixed Reality. Systems and Applications, pages 179-187. Springer Berlin Heidelberg, 2013. (bibtex: Keefe-2013-VRD). H. Cai, Jian Chen, A. Aachus, Stephen Correia, and David H. Laidlaw. 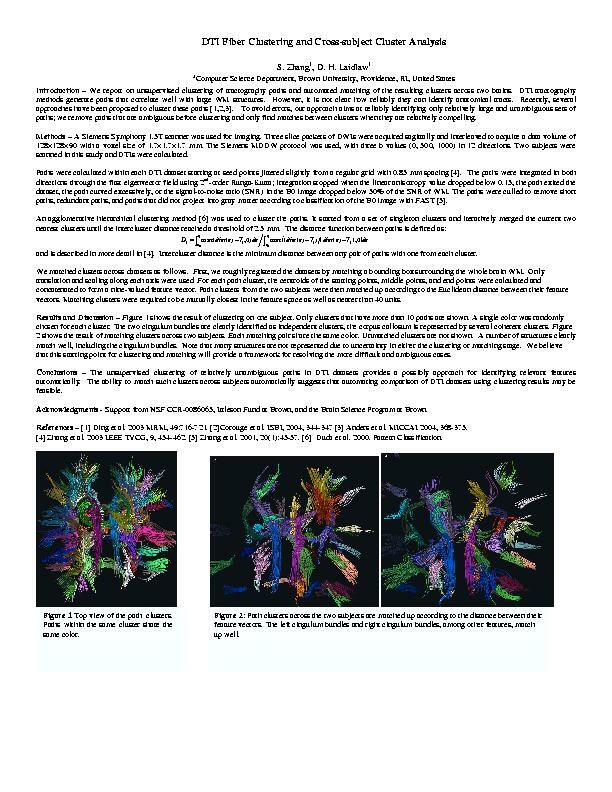 InShape: In-Situ Shape-Based Interactive Multiple-View Exploration of Diffusion MRI Visualizations. In Advances in Visual Computing, Proc. ISVC, pages 706-715. Springer, 2012. (bibtex: Cai-2012-ISI). Jian Chen, H. Cai, David H. Laidlaw, and A. P. Aachus. The effects of seeding resolution on diffusion tensor imaging streamtube visualization comprehension. In Alzheimer's & Dementia, volume 8, page P59, 2012. (bibtex: Chen-2012-ESR). Jian Chen, H. Cai, A. P. Aachus, and David H. Laidlaw. Effects of Stereo and Screen Size on the Legibility of Three-Dimensional Streamtube Visualization. In IEEE Transactions on Visualization and Computer Graphics (Proc. 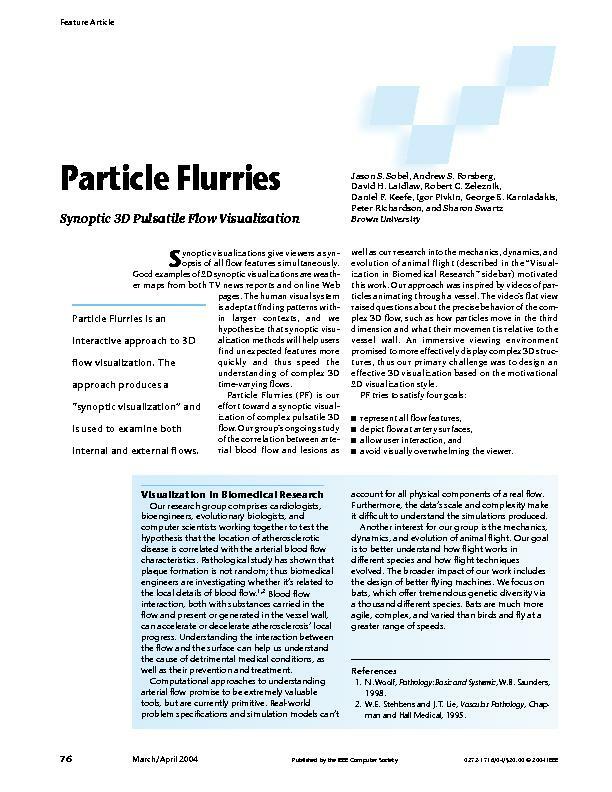 IEEE SciVis), volume 18, pages 2130-2139, 2012. (bibtex: Chen-2012-ESS). Cagatay Demiralp, Radu Jianu, and David H. Laidlaw. Exploring Brain Connectivity with Two-dimensional Maps. In New Developments in the Visualization and Processing of Tensor Fields. 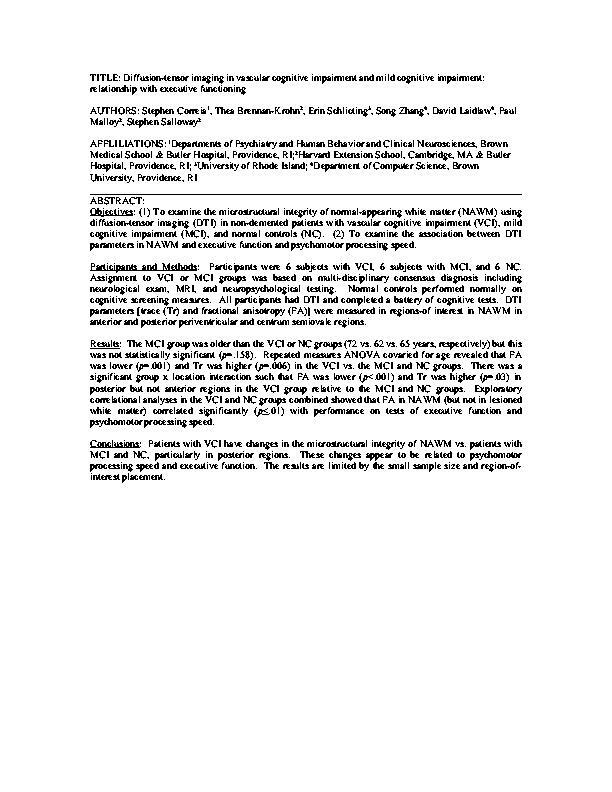 LNCS-Springer, 2012. (pdf) (bibtex: Demiralp-2012-EBC). Cagatay Demiralp. Exploring Brain Connectivity with Two-dimensional Neural Maps. In Visual Strategies. Yale Press, 2012. (bibtex: Demiralp-2012-B2D). Steven R. Gomez and David H. Laidlaw. Modeling Task Performance for a Crowd of Users from Interaction Histories. In Proceedings of the ACM Conference on Human Factors in Computing Systems (CHI), Best Note Honorable Mention, 2012. (pdf) (bibtex: Gomez-2012-MTP). Steven R. Gomez, Radu Jianu, Caroline Ziemkiewicz, Hua Guo, and David H. Laidlaw. Different Strokes for Different Folks: Visual Presentation Design between Disciplines. In IEEE Transactions on Visualization and Computer Graphics (Proc. InfoVis), volume 18, pages 2411-2420, 2012. (pdf) (bibtex: Gomez-2012-DSD). Hua Guo, Diem Tran, and David H. Laidlaw. Incorporating GOMS Analysis into the Design of an EEG Data Visual Analysis Tool. In Proceedings of IEEE InfoVis (Posters), 2012. (pdf) (bibtex: Guo-2012-IGA). Radu Jianu, Wenjin Zhou, Ryan Cabeen, Daniel Dickstein, and David H. Laidlaw. Visualizing tractography metrics of cortical-connectivity integrity in diffusion imaging. 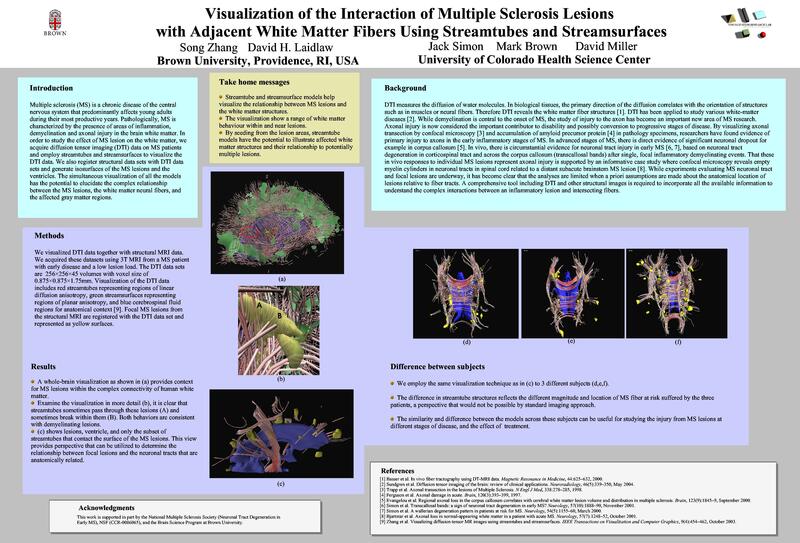 In ISMRM, 2012. (pdf) (bibtex: Jianu-2012-VTM). Radu Jianu and David H. Laidlaw. 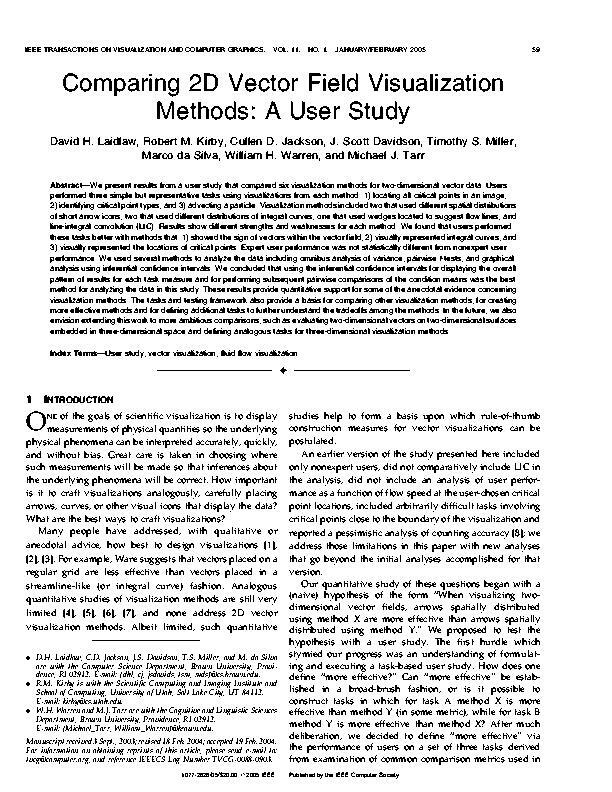 An Evaluation of How Small User Interface Changes Can Improve Scientists Analytic Strategies. In Proceedings of the SIGCHI conference on human factors in computing systems, 2012. (pdf) (bibtex: Jianu-2012-EHS). David H. Laidlaw and A. Vilanova. New Developments in the Visualization and Processing of Tensor Fields. Springer, 2012;. (bibtex: Laidlaw-2012-NDV). Caroline Ziemkiewicz, Steven R. Gomez, and David H. Laidlaw. Analysis Within and Between Graphs: Observed User Strategies in Immunobiology Visualization. In ACM CHI, 2012. (pdf) (bibtex: Cziemkiewicz-2012-AGO). D. Zikic, B. Glocker, E. Konukoglu, A. Criminisi, Cagatay Demiralp, J. Shatton, O. Thomas, T. Das, R. Jena, and S. Price. Decision Forests for Tissue-specific Segmentation of High-grade Gliomas in Multi-channel MR. In Proceedings of MICCAI, 2012. (pdf) (bibtex: Zikic-2012-DFT). D. Zikic, B. Glocker, E. Konukoglu, J. Shatton, A. Criminisi, D. H. Ye, Cagatay Demiralp, , O. Thomas, T. Das, R. Jena, and S. Price. Context-sensitive Classification Forests for Segmentation of Brain Tumor Tissues. 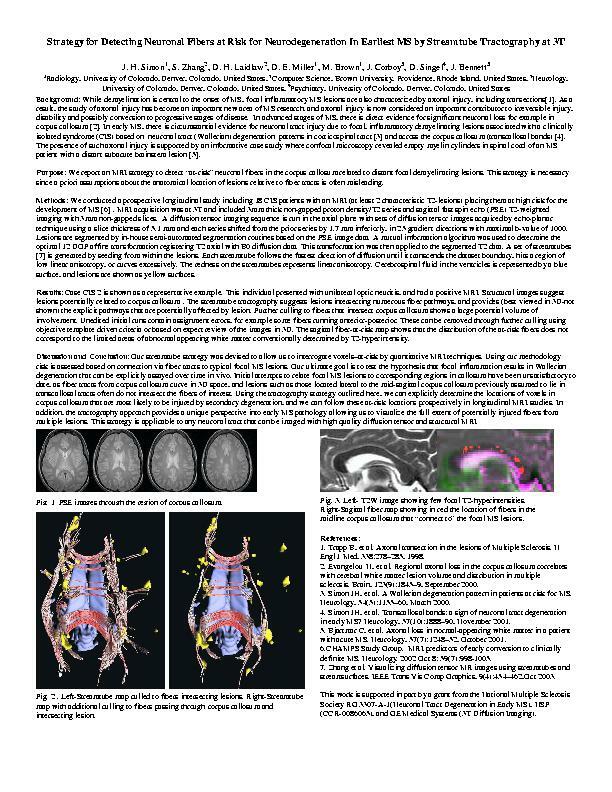 In Proceedings of MICCAI BRATS WorkshopMICCAI 2012 Challenge on Multimodal Brain Tumor Segmentation, 2012. (pdf) (bibtex: Zikic-2012-CFI). Cagatay Demiralp and David H. Laidlaw. Generalizing Diffusion Tensor Model using Probabilistic Inference in Markov Random Fields. 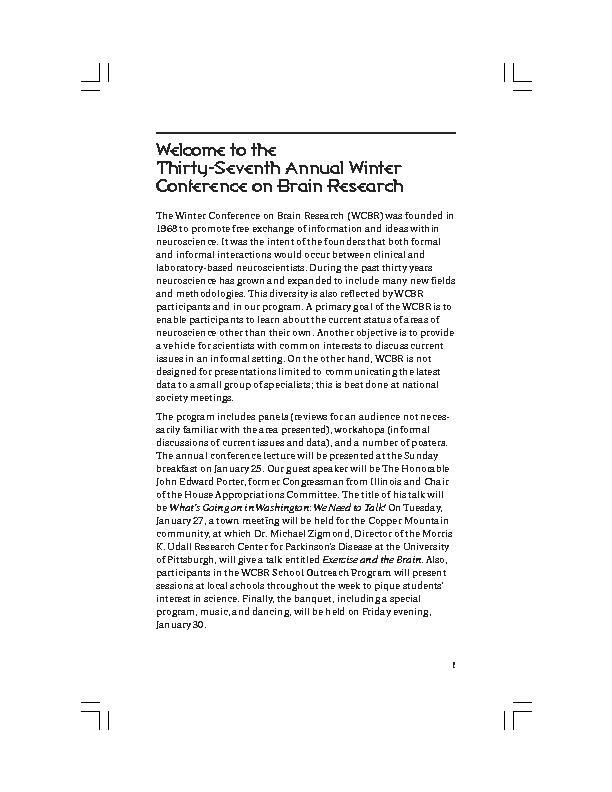 In Proceedings of MICCAI CDMRI Workshop, 2011. (bibtex: Demiralp-2011-MRF). Cagatay Demiralp and David H. Laidlaw. Theories of Visualization: Are There Any? . VisWeek'11 Panel, 2011. (pdf) (bibtex: Demiralp-2011-TVS). Steven R. Gomez and David H. Laidlaw. Modeling Human Performance from Visualization Interaction Histories. In Proceedings of IEEE InfoVis (Posters), 2011. (pdf) (bibtex: Gomez-2011-MHP). Radu Jianu, Cagatay Demiralp, and David H. Laidlaw. Exploring brain connectivity with two-dimensional neural maps. IEEE TVCG, 2011. (pdf) (bibtex: Jianu-2011-EBJ). Radu Jianu and David H. Laidlaw. Guiding Visualization Users Towards Improved Analytic Strategies Using Small Interface Changes. In IEEE Visualization 2010 Poster Compendium, 2011. (pdf) (bibtex: Jianu-2011-GVU). Stacy Lovell Pfautz, Bruce Skarin, Cullen Jackson, and David H. Laidlaw. Adaptive agents for real-time data-driven visualization and analysis for relevant knowledge (AARDVARK). In Proceedings HSCB Focus 2011 conference (poster), 2011. (bibtex: Pfautz-2011-AAR). Wenjin Zhou and David H. Laidlaw. 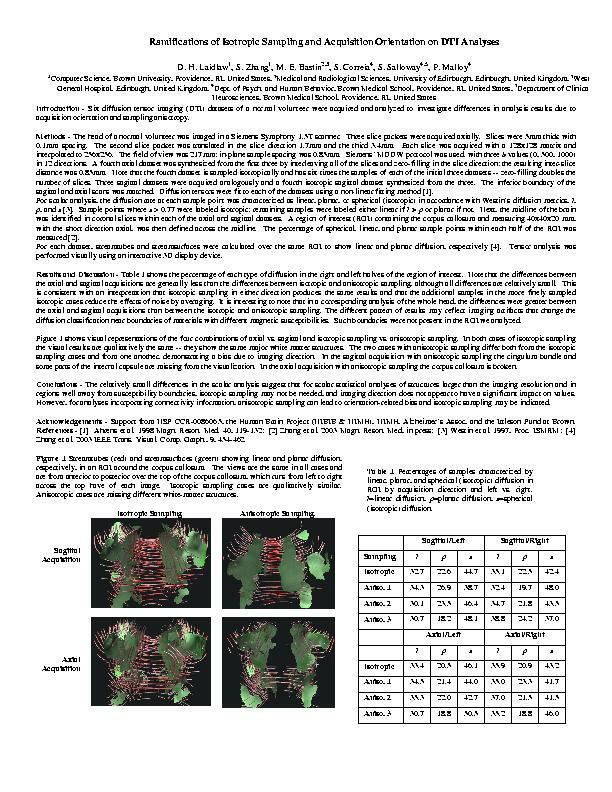 Inferring Axon Properties with d-PGSE MRI using Analytical Water Diffusion Model. In CONNECT meeting (MRI of brain microstructure and connectivity), Tel Aviv, Israel, Feb, 2011 2011. (pdf) (bibtex: Zhou-2011-IAP). Wenjin Zhou and David H. Laidlaw. Measurement of axon radii distribution in orientationally unknown tissue using angular double-pulsed gradient spin echo (double-PGSE) NMR. In ISMRM, 2011. (pdf) (bibtex: Zhou-2011-MAR). Jian Chen, Daniel K. Riskin, Tatjana Y. Hubel, David Willis, Arnold Song, Hanyu Liu, Kenneth Breuer, Sharon Swartz, and David H. Laidlaw. Exploration of Bat Wing Morphology Through A Strip Method and Visualization. In SIGGRAPH (talk), 2010. (pdf) (bibtex: Chen-2010-STI). Steven R. Gomez. Interacting with Live Preview Frames: In-Picture Cues for a Digital Camera Interface. In Proceedings of UIST (Posters), 2010. (pdf) (bibtex: Gomez-2010-ILP). Hans-Christian Hege, David H. Laidlaw, and Raghu Machiraju. Guest Editors' Introduction: Special Section on Volume Graphics and Point-Based Graphics, IEEE TVCG 16(4). IEEE, 2009,. (bibtex: Hege-2010-VGP). Radu Jianu, Cagatay Demiralp, and David H. Laidlaw. Exploring brain connectivity with two-dimensional neural maps. 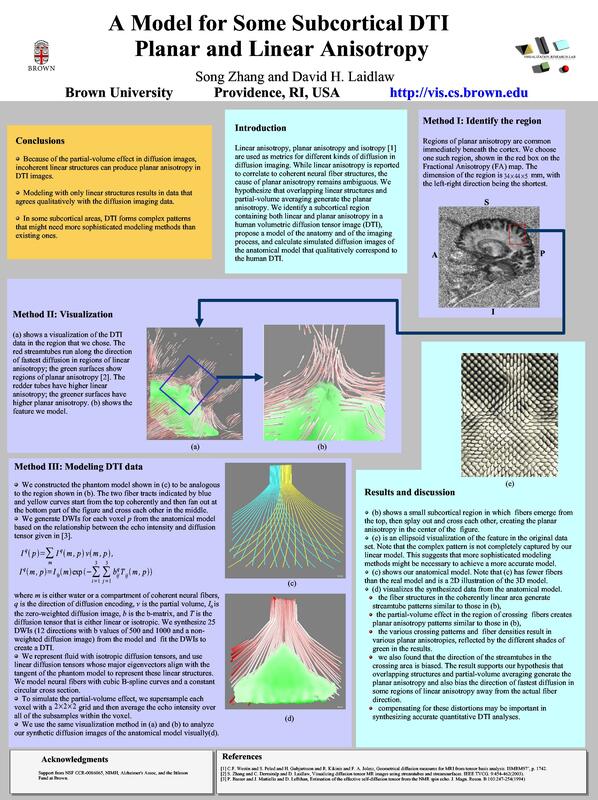 In IEEE Visualization 2010 Poster Compendium (Best Poster Award), 2010. (pdf) (bibtex: Jianu-2010-EBC). Radu Jianu, Cagatay Demiralp, and David H. Laidlaw. Visualizing and exploring tractograms via two-dimensional connectivity maps. 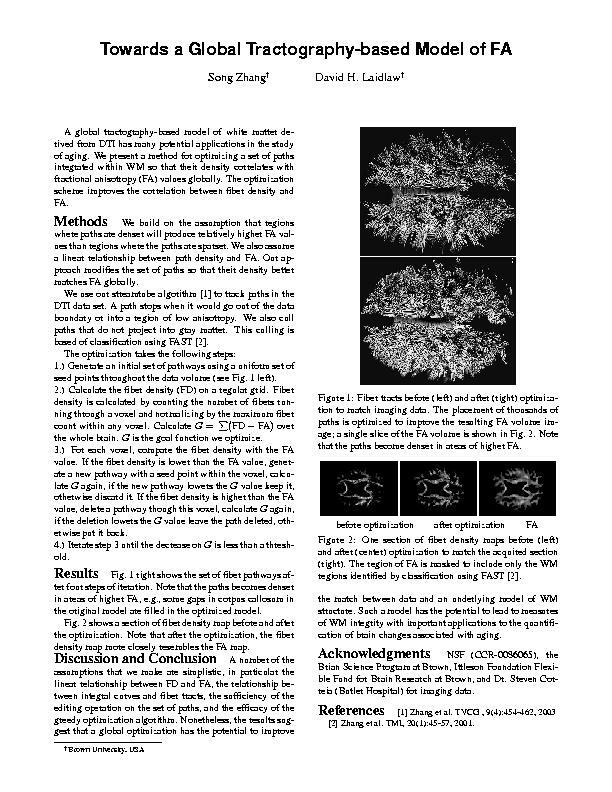 In Proceedings of ISMRM'10, 2010. (pdf) (bibtex: Jianu-2010-VET). Radu Jianu and David H. Laidlaw. Visualizing Gene Co-Expression as Google Maps. In ISVC Proceedings 2010, 2010. (pdf) (bibtex: Jianu-2010-VGC). Radu Jianu and David H. Laidlaw. Visualizing Protein Interaction Networks as Google Maps. In IEEE Visualization 2010 Poster Compendium, 2010. (pdf) (bibtex: Jianu-2010-VPI). Joerg Meyer, Jim Thomas, Stephan Diehl, Brian Fisher, Daniel Keim, David H. Laidlaw, Silvia Miksch, Klaus Mueller, William Ribarsky, Bernhard Preim, and Anders Ynnerman. From visualization to visually enabled reasoning. Dagstuhl Follow-Ups, (1), 2010. (pdf) (bibtex: Meyer-2010-VVE). Trevor M. O'Brien, Anna M. Ritz, Benjamin J. Raphael, and David H. Laidlaw. Gremlin: An Interactive Visualization Model for Analyzing Genomic Rearrangements. IEEE Trans. on Visualization and Computer Graphics (Proc. Information Visualization '10), 2010. (pdf) (bibtex: OBrien-2010-GIV). Gabriel Taubin and Cagatay Demiralp. Surface Deformations Driven by Vector-Valued 1-Forms. In Proceedings of SMI'10, 2010. (pdf) (bibtex: Taubin-2010-SDV). Wenjin Zhou and David H. Laidlaw. Inferring Axon Properties with double-PGSE MRI using Analytical Water Diffusion Model. 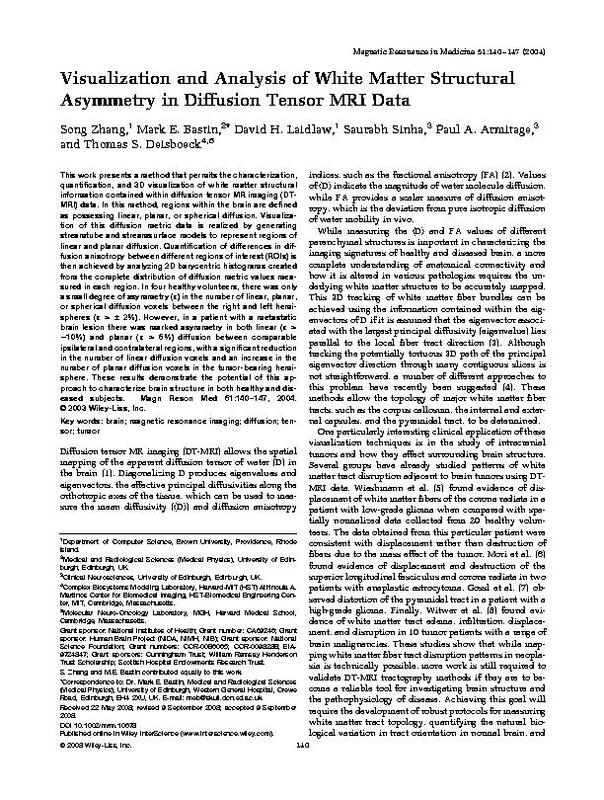 In In Proceedings of ISMRM, chosen for podium talk, 2010. (pdf) (bibtex: Zhou-2010-IAP). Wenjin Zhou, David H. Laidlaw, and Matt G. Hall. Inferring Microstructural Properties Using Angular Double Pulsed Gradient Spin Echo NMR in Orientationally Unknown Tissue. In Proceedings of CDMRI Workshop at MICCAI 2010, 2010. (pdf) (bibtex: Zhou-2010-IMP). Andrew Bragdon and David H. Laidlaw. The design and evaluation of a lightweight multi-view interaction metaphor for 3D visualization in the CAVE. In Proceesings SIGGRAPH, Posters Program, 2009. (bibtex: Bragdon-2009-DEL). Jian Chen, Doug A. Bowman, and David H. Laidlaw. Poster: A hybrid direct visual editing method for architectural massing study in virtual environments. In Proceedings IEEE Symposium on 3D User Interfaces, Posters Program, 2009. (bibtex: Chen-2009-PHD). Andrew Forsberg, Jian Chen, and David H. Laidlaw. Comparing 3D Vector Field Visualization Methods: A User Study. In Proceedings of IEEE Visualization, pages 1219-1226, 2009. (pdf) (bibtex: Forsberg-2009-CFM). Radu Jianu, Adrian Rusu, Andrew Fabian, and David H. Laidlaw. A Coloring Solution to the Edge Crossing Problem. In Proceedings of the 12th Conference on Information Visualisation, 2009. 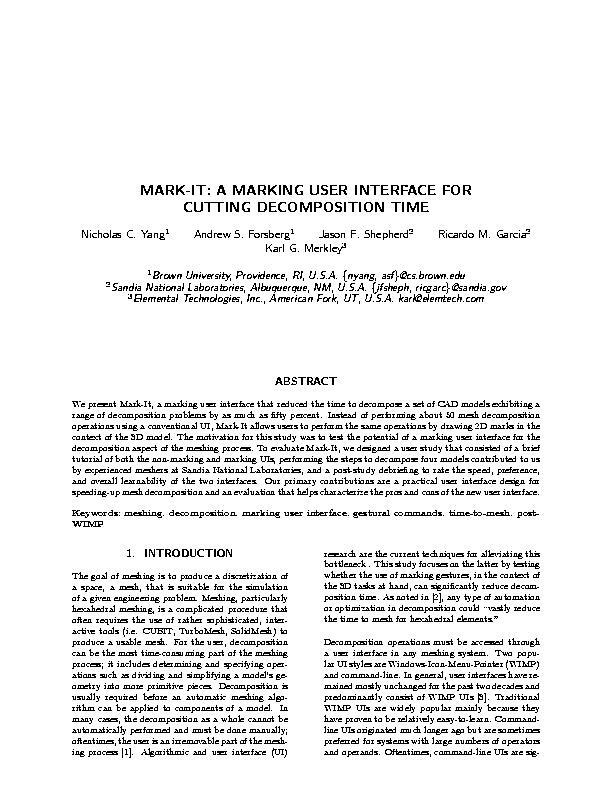 (pdf) (bibtex: Jianu-2009-CSE). Radu Jianu, Cagatay Demiralp, and David H. Laidlaw. 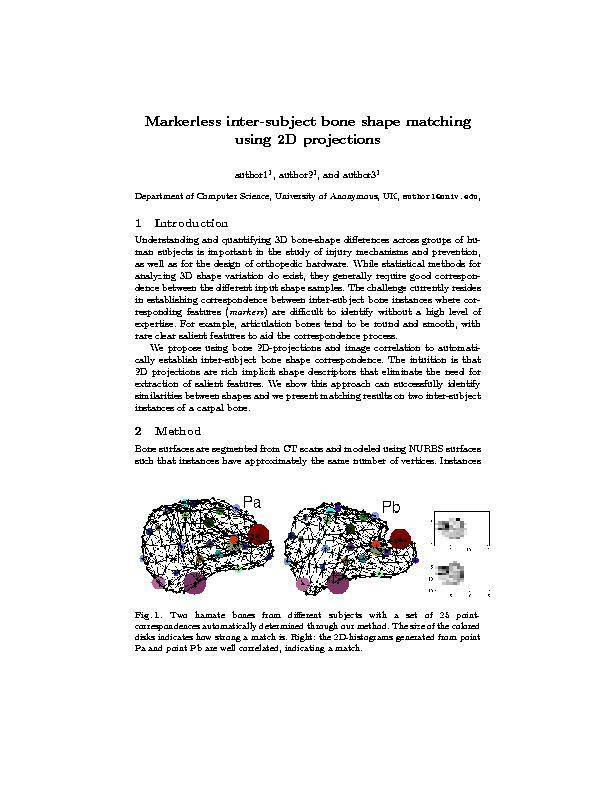 Exploring 3D DTI fiber-tracts with linked 2D representations. IEEE Trans. on Visualization and Computer Graphics (Proc. Visualization '09), 15(6):1449-1456, 2009. (pdf) (bibtex: Jianu-2009-E3D). Radu Jianu, Kebing Yu, Vinh Nguyen, Lulu Cao, Arthur Salomon, and David H. Laidlaw. Visual integration of quantitative proteomic data, pathways and protein interactions. IEEE Trans. on Visualization and Computer Graphics, September 2009. (pdf) (doc) (bibtex: Jianu-2009-EVI). David H. Laidlaw, 2009. Unknown (pdf) (bibtex: Paul-2009-HIV). David H. Laidlaw and Joachim Weickert. 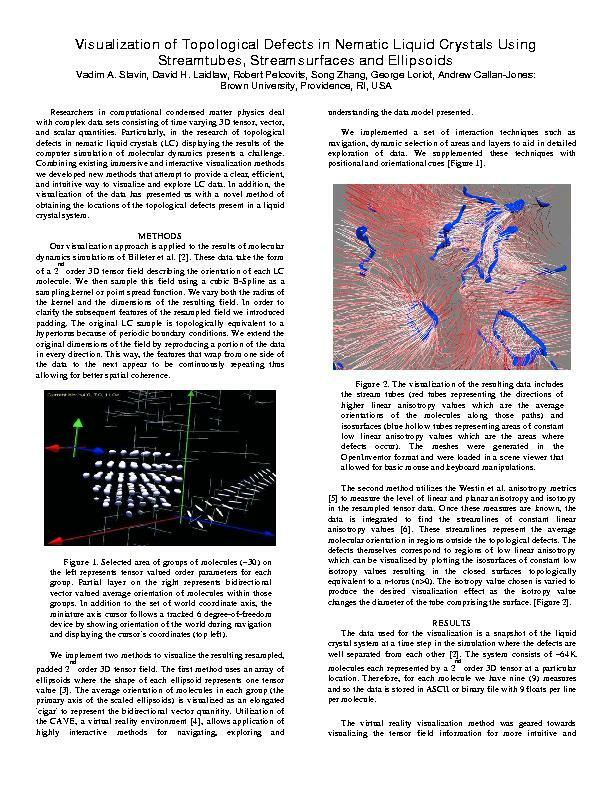 Visualization and Processing of Tensor Fields: Advances and Perspectives,. Springer, 2009,. (bibtex: Laidlaw-2009-VPT). Vinh Nguyen, Lulu Cao, Jonathan Lin, Anna Ritz, Norris Hung, Radu Jianu, Benjamin Raphael, David H. Laidlaw, Laurent Brossay, and Arthur Salomon. A New Approach for Quantitative Phosphoproteomic Dissection of Signaling Pathways Applied to T Cell Receptor Activation. 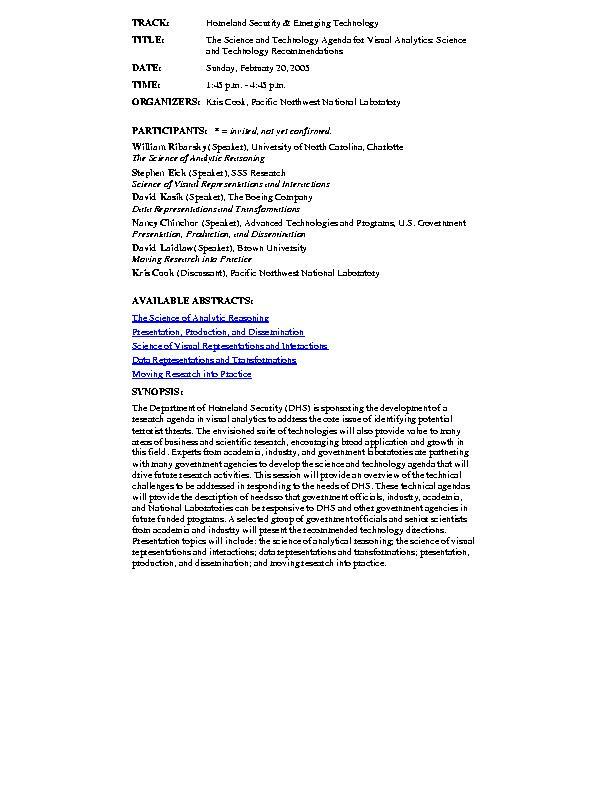 Molecular and Cellular Proteomics, 8(11):2418-2431, 2009. (bibtex: Nguyen-2009-NAQ). Mangala Srinivas, Michael S. Turner, Jelena M. Janjic, Penelope A. Morel, David H. Laidlaw, and Eric T. Ahrens. In Vivo Cytometry of Antigen-Specific T Cells Using 19F MRI. Magnetic Resonance in Medicine, 34(6):747-753, 2009. 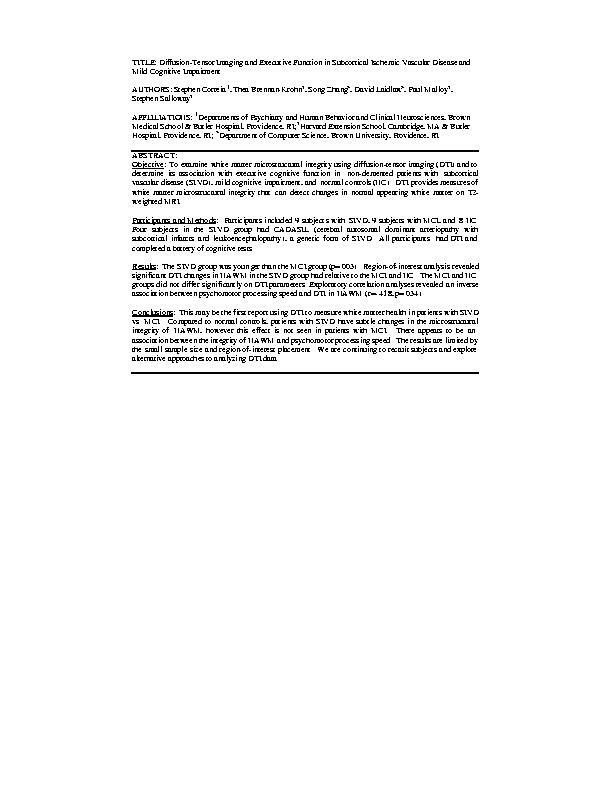 (pdf) (bibtex: Srinivas-2009-IVC). Daniel Acevedo, Cullen Jackson, David H. Laidlaw, and Fritz Drury. Using Visual Design Experts in Critique-based Evaluation of 2D Vector Visualization Methods. IEEE Transactions on Visualization and Computer Graphics, 14(4):877-884, July 2008. (pdf) (bibtex: Acevedo-2008-UVD). Daniel Keefe, Robert Zeleznik, and David H. Laidlaw. Tech-note: Dynamic Dragging for Input of 3D Trajectories. In IEEE Symposium on 3D User Interfaces, 2008. (pdf) (bibtex: Keefe-2008-TDD). Robert Kosara, Fritz Drury, Lars E. Holmquist, and David H. Laidlaw. Visualization Criticism. IEEE Computer Graphics and Applications, 28(3):13-15, 2008. (bibtex: Kosara-2008-VCX). Joseph LaViola, Andrew Forsberg, David H. Laidlaw, and Andries van Dam. 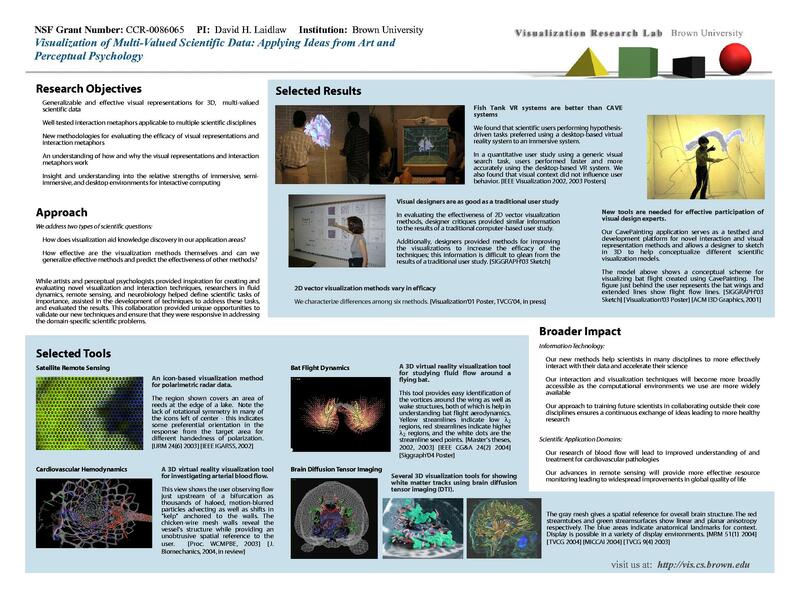 Virtual Reality-Based Interactive Scientific Visualization Environments. Springer-Verlag London Limited, pages 225-250, 2008. (pdf) (bibtex: LaViola-2008-VRB). Trevor M. O'Brien, Daniel Keefe, and David H. Laidlaw. A Case Study in Using Gestures and Bimanual Interaction to Overload a High-DOF Input Device. ACM I3D Symposium on Interactive 3D Graphics and Games, Posters, February 2008. (bibtex: OBrien-2008-CSU). DK Riskin, DJ Willis, J. Iriate-Diaz, TL Hedrick, Mykhaylo Kostandov, Jian Chen, David H. Laidlaw, Kenneth Breuer, and Sharon Swartz. 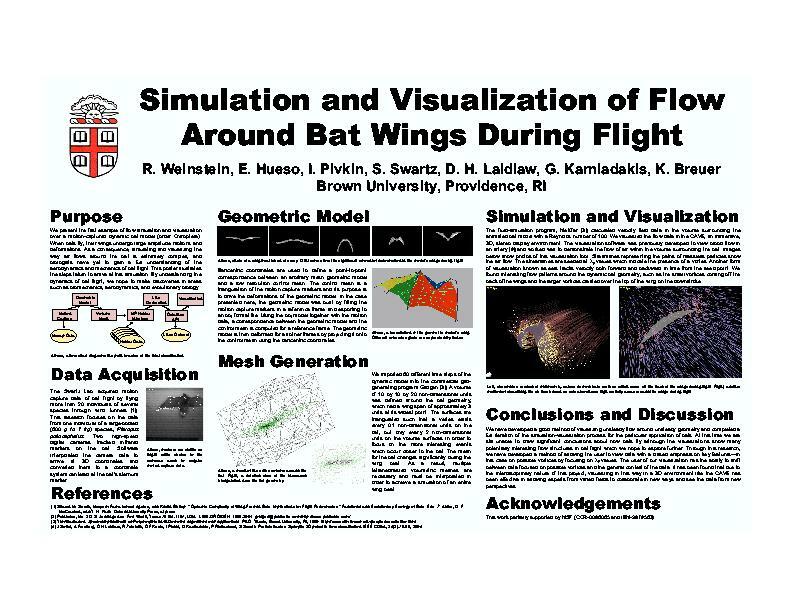 Quantifying the complexity of bat wing kinematics. Journal of Theoretical Biology, 2008. In Press (pdf) (bibtex: Riskin-2008-QCB). Daniel Acevedo. A Framework for the Perceptual Optimization of Multivalued Multilayered 2D Scientific Visualization Methods. PhD thesis, Computer Science Department, Brown University, 2007. (pdf) (ppt) (bibtex: Acevedo-2007-FPO). Daniel Acevedo, Jian Chen, and David H. Laidlaw. Modeling Perceptual Dominance Among Visual Cues in Multilayered Icon-based Scientific Visualizations. IEEE Visualization'07, Poster Compendium, 2007. (pdf) (bibtex: Acevedo-2007-MPD). Jian Chen, Andrew Forsberg, Mykhaylo Kostandov, Dave Willis, and David H. Laidlaw. 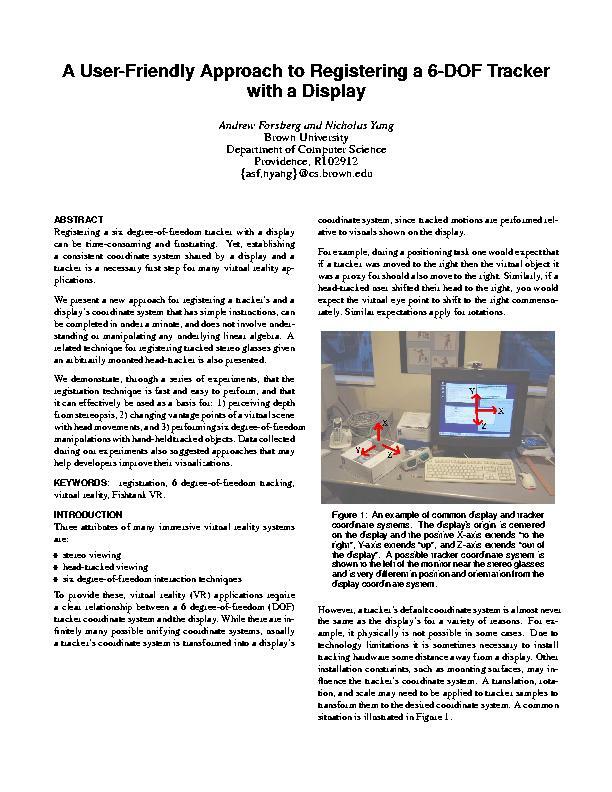 The Effect of Using Large, High-Resolution Stereoscopic Displays for Flow Visualization. 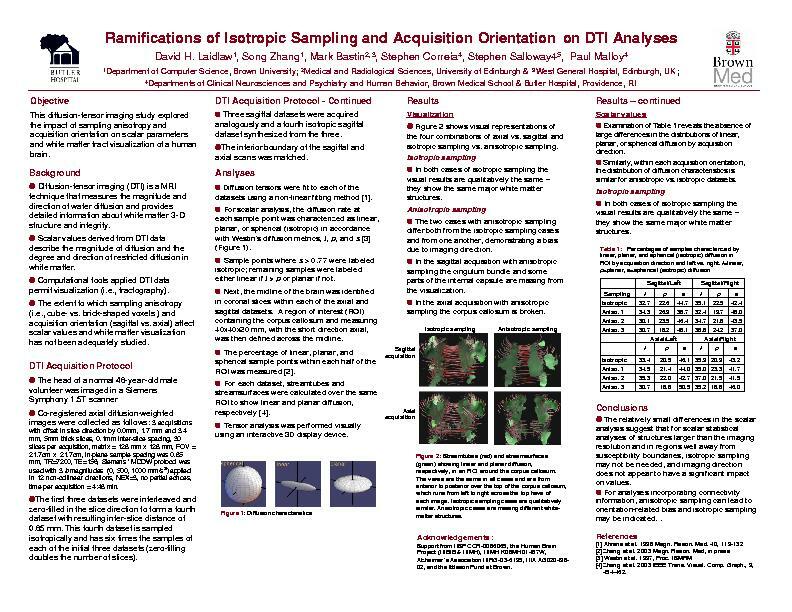 In Proceedings of SIGGRAPH poster, 2007. (pdf) (bibtex: Chen-2007-DSF). Cagatay Demiralp. Charm: A charming network coordinate system. Technical report, Brown University, Department of Computer Science, 2007. 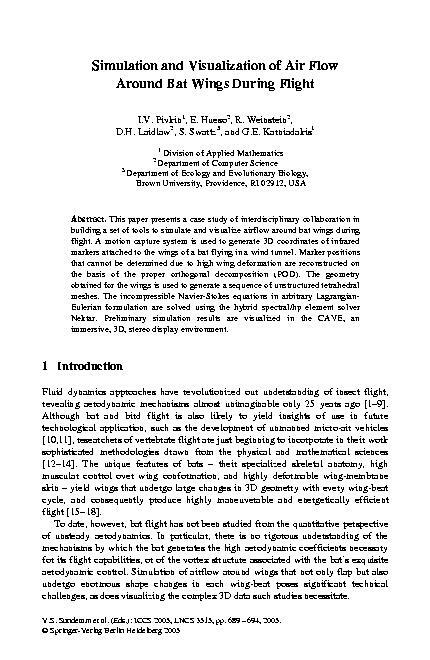 (pdf) (bibtex: Demiralp-2007-CCN). Cagatay Demiralp, Daniel Acevedo, Song Zhang, David Tate, Stephen Correia, and David H. Laidlaw. Connectivity-aware sectional visualization of DTI volumes. Technical report, Department of Computer Science, Brown University, 2007. (pdf) (bibtex: Demiralp-2007-CSV). Doria Jianu, Wenjin Zhou, Cagatay Demiralp, and David H. Laidlaw. Visualizing Spatial Relations Between 3D-DTI Integral Curves Using Texture Patterns. In IEEE Visualization Poster Compendium, 2007. (pdf) (bibtex: Jianu-2007-VSR). Mykhaylo Kostandov, Jonas Schwertfeger, Odest Chadwicke Jenkins, Radu Jianu, Mark Buller, Daniel Hartmann, Matthew Loper, Aggeliki Tsoli, Marek Vondrak, Wenjin Zhou, and Mark Fiala. Robot Gaming and Learning using Augmented Reality. ACM Siggraph 2007 Poster Compendium, August 2007. (pdf) (bibtex: Kostandov-2007-RGL). Joseph LaViola, Prabhat, Andrew Forsberg, David H. Laidlaw, and Andries van Dam. Virtual Reality-Based Interactive Scientific Visualization Environments. In Interactive Visualization: A State-of-the-Art Survey. Springer Verlag, 2008. In Press (pdf) (doc) (bibtex: LaViola-2007-VRI). Prabhat, Andrew Forsberg, Michael Katzourin, Kristi Wharton, and Mel Slater. 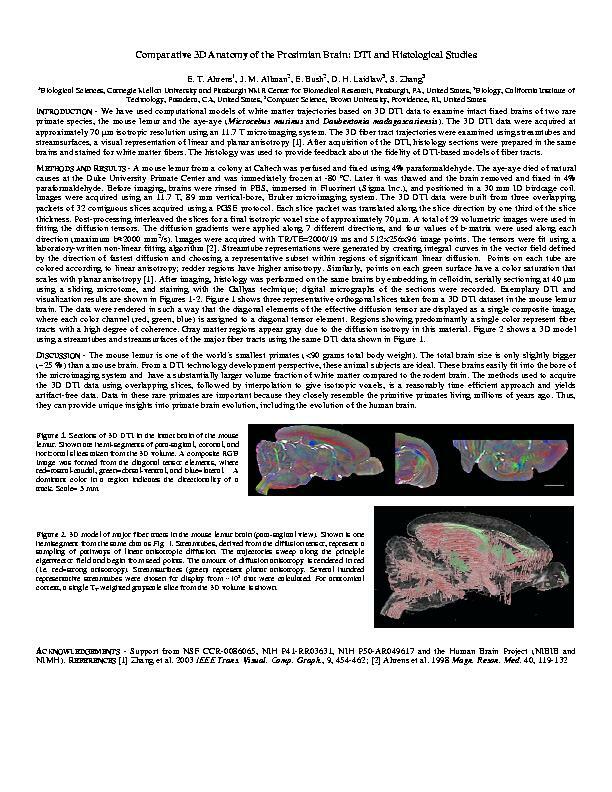 A Comparative Study of Desktop, Fishtank and Cave Systems for the Exploration of Volume Rendered Confocal Data Sets. IEEE Transactions on Visualization and Computer Graphics, 2007. (bibtex: Prabhat-2007-CSD). Song Zhang, Stephen Correia, and David H. Laidlaw. 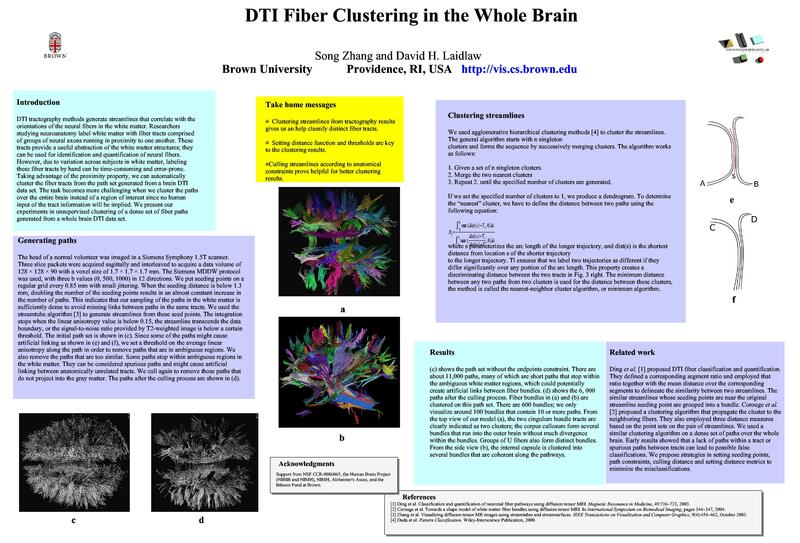 Identifying white-matter fiber bundles in DTI data using an automated proximity-based fiber-clustering method. IEEE, 2007. 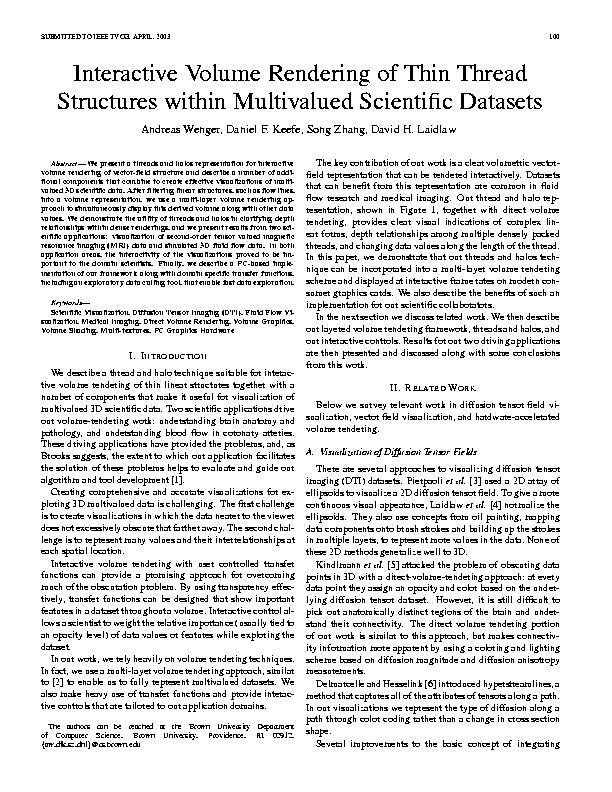 (pdf) (bibtex: Zhang-2007-IWM). Daniel Acevedo and David H. Laidlaw. 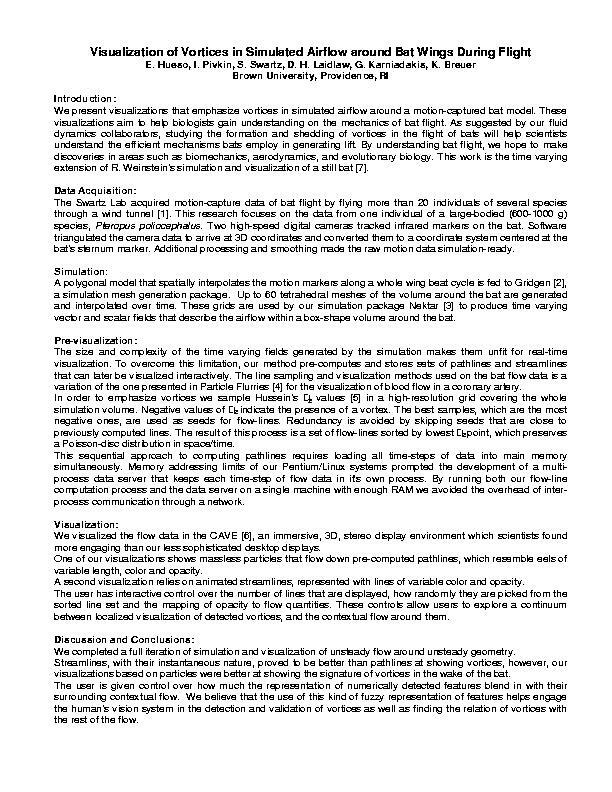 Subjective Quantification of Perceptual Interactions among Some 2D Scientific Visualization Methods. IEEE Transactions on Visualization and Computer Graphics (Proceedings Visualization / Information Visualization), 12(5), September-October 2006. (pdf) (bibtex: Acevedo-2006-SQP). Mykhaylo Kostandov, Radu Jianu, Wenjin Zhou, and Tomer Moscovich. Interactive Layered Character Animation in Immersive Virtual Environments. ACM Siggraph 2006 Poster Compendium, August 2006. (pdf) (bibtex: Kostandov-2006-ILC). Song Zhang and David H. Laidlaw. Sampling DTI integral curves based on DWI forward modeling. In Proceedings of the IEEE International Conference of the Engineering in Medicine and Biology Society (EMBS), New York, NY, August-September 2006. 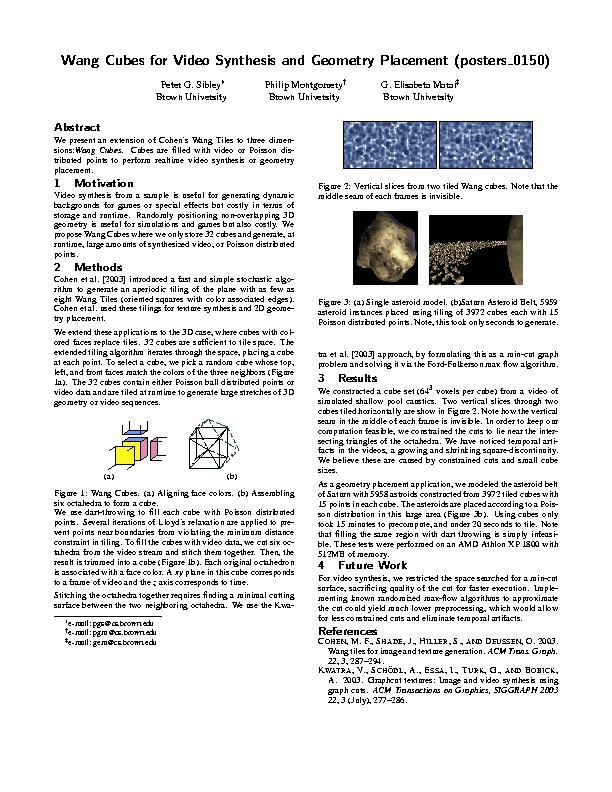 In Press (pdf) (bibtex: Zhang-2006-SDI). Daniel Acevedo, Cullen Jackson, David H. Laidlaw, and Fritz Drury. Using Visual Design Expertise to Characterize the Effectiveness of 2D Scientific Visualization Methods. In Proceedings IEEE Visualization, Poster Compendium (BEST POSTER AWARD), October 2005. (pdf) (bibtex: Acevedo-2005-UVD). Don House, Victoria Interrante, David H. Laidlaw, Russell Taylor, and Colin Ware. Panel: Design and Evaluation in Visualization Research. In Proceedings of IEEE Visualization Conference, Minneapolis, MN, October 2005. (pdf) (bibtex: House-2005-DEV). Mykhaylo Kostandov and Joerg Meyer. Smooth Panning and Zooming in Virtual Reality Visualization of Large-Scale Datasets. Undergraduate Research Opportunity Program Symposium, Irvine, CA, May 2005. (bibtex: Kostandov-2005-SPZ). Ethan Bromberg, Arni Jonsson, G. Elisabeta Marai, and Morgan McGuire. Hybrid Billboard Clouds for Model Simplification. ACM SIGGRAPH 2004 Poster Compendium, August 2004. (pdf) (bibtex: Bromberg-2004-HBC). Andrew Forsberg and Nicholas Yang. A User�Friendly Approach to Registering a 6-DOF Tracker with a Display. In Proceedings of the 8th International Immersive Projection Technology Workshop, Iowa State University, Ames, IA, May 2004. (pdf) (bibtex: Forsberg-2004-UAR). Michael Kirby, Daniel Keefe, and David H. Laidlaw. Painting and Visualization. In Visualization Handbook. Academic Press, June 2004. (pdf) (bibtex: Kirby-2004-PAV). Mykhaylo Kostandov and Joerg Meyer. Navigation System for Virtual Reality Visualization of Large-Scale Astronomical Datasets. Undergraduate Research Opportunity Program Symposium, Irvine, CA, May 2004. (bibtex: Kostandov-2004-NSV). David H. Laidlaw. Visualization of Multi-Valued Scientific Data: Applying Ideas from Art and Perceptual Psychology. Poster for NSF, June 2004. (pdf) (bibtex: Laidlaw-2004-VMS). Dmitri Lemmerman and Andrew Forsberg. 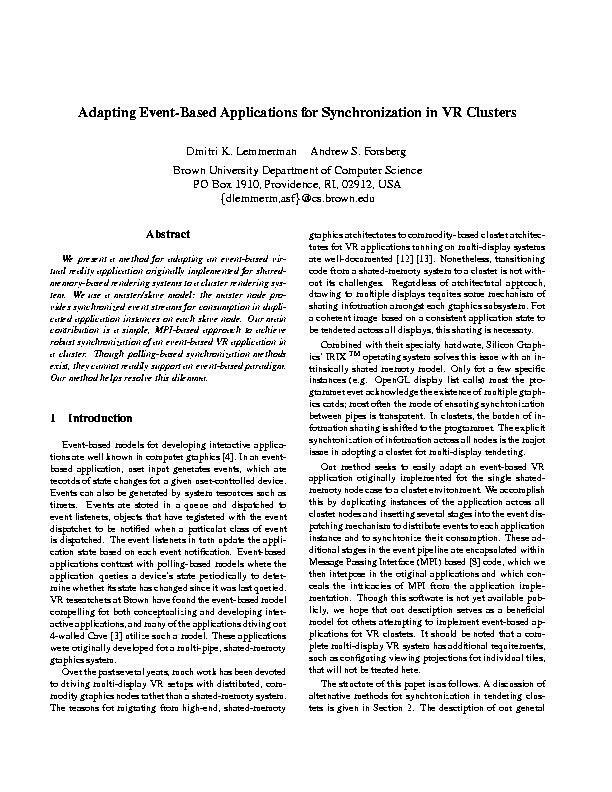 Adapting Event-Based Applications for Synchronization in VR Clusters. In Proceedings of the 8th International Immersive Projection Technology Workshop, Iowa State University, Ames, IA, May 2004. (pdf) (bibtex: Lemmerman-2004-AEA). Michael Leyton, Doug DeCarlo, David H. Laidlaw, and Frediric Leymarie. Computational Aspects of Paintings. Panel at 2004 SIAM Conference on Geometric Design and Computing, November 2004. (bibtex: Leyton-2004-CAP). Jürgen Schulze and Andrew Forsberg. A Comparison of a Cave and a Fish Tank VR System for Counting Biological Features in a Volume. Technical report, Brown University, 2004. (pdf) (bibtex: Schulze-2004-CCF). Catherine Dube, David H. Laidlaw, and Thompson Webb III. Faculty Forum: Teaching Innovations, . In The Teaching Exchange, Brown University, January 2003. (pdf) (bibtex: Dube-2003-FFT). Kevin Audleman, David H. Laidlaw, and Steve Reiss. TIV: A Thread Interaction Viewer. 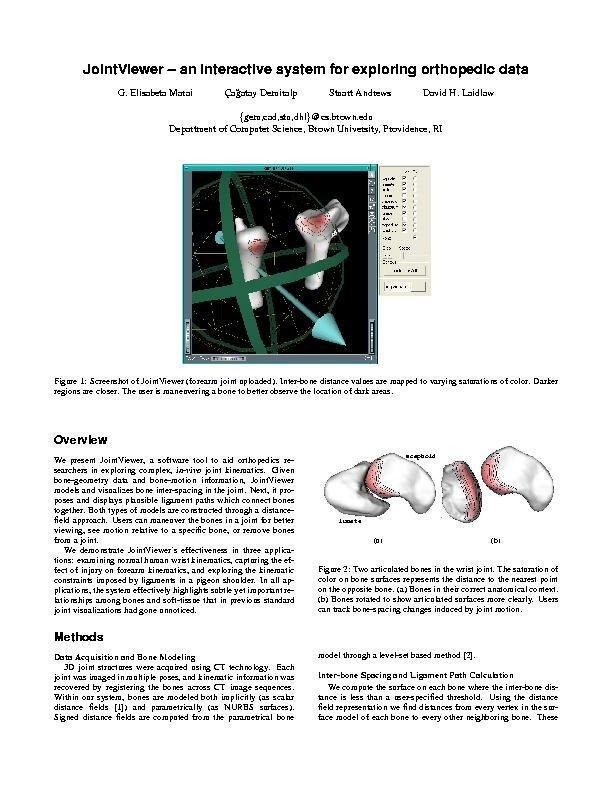 In Poster Proceedings of IEEE Visualization, October 2002. (pdf) (ppt) (bibtex: Audleman-2002-TIV). Joseph LaViola, Daniel Acevedo, Daniel Keefe, and Robert Zeleznik. 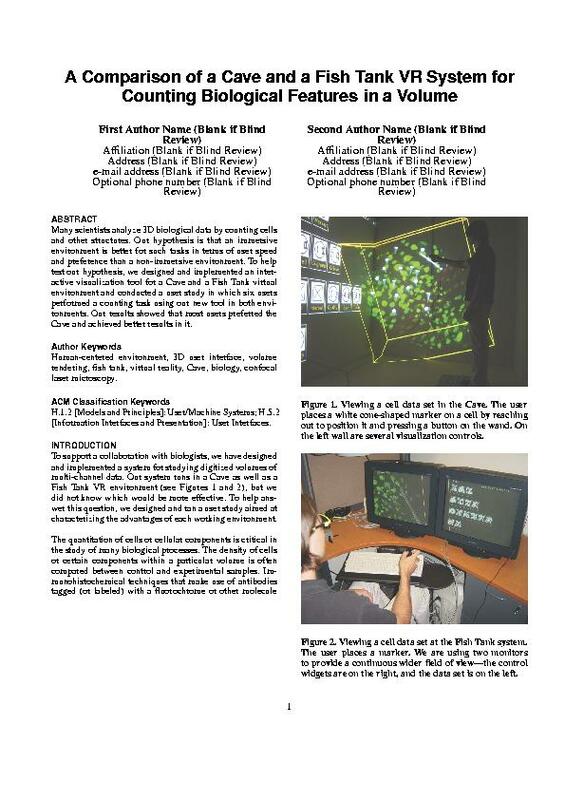 Hands-Free Multi-Scale Navigation in Virtual Environments. In Proceedings of ACM Symposium on Interactive 3D Graphics, pages 9-15, March 2001. (pdf) (bibtex: LaViola-2001-HFM). David H. Laidlaw, Michael Tarr, and George Karniadakis. Visualization of Multi-valued Scientific Data: Applying Ideas from Art and Perceptual Psychology. NSF ITR Grant Proposal, September 2000. (pdf) (bibtex: Laidlaw-2000-VMS).